When you’re aiming to hit multiple muscle groups with one exercise, it pays to think about your positioning. That’s how Men’s Health fitness director Ebenezer Samuel, C.S.C.S. makes the most of this arm day workout. 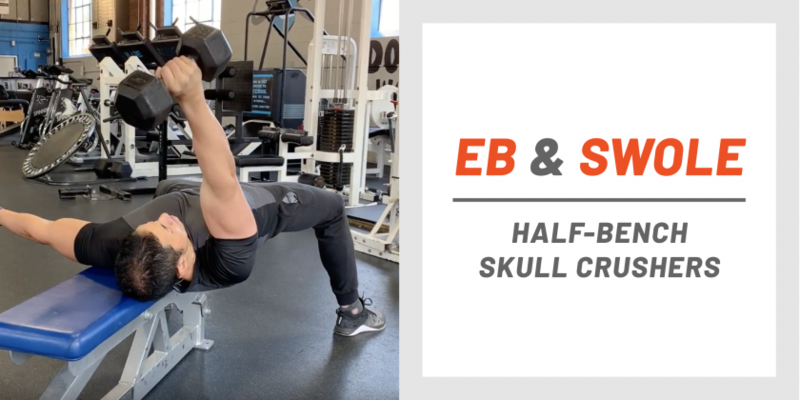 He takes a single-arm skull crusher—an exercise that typically isolates the triceps—and adds a healthy dose of balance and anti-extension action that makes your core work overtime to keep yourself stable. To perform the half-bench skull crusher, you’ll need a sturdy bench and a light to medium weight dumbbell. Check out this adjustable option from Bowflex if you don’t have a set handy. Lie back on the bench with a dumbbell in one hand. Shift yourself over to that side so that your spine, half your torso, and one glute are completely off the bench. Squeeze your glute and brace your core to keep a strong, stable base throughout the exercise. Lift the dumbbell so that your arm is at a 91-degree angle with your torso. Extend the opposite arm straight out to the side to help keep your balance. Hinge your elbow to lower the weight straight down beside your head, then squeeze your triceps to lift it back into that 91-degree position. To add the half-bench skull crusher to your arm day, try 3 sets of 10 to 12 reps per side. For more tips and routines from Samuel, check out our full slate of Eb and Swole workouts. If you want to try an even more dedicated routine, consider Eb’s New Rules of Muscle program.